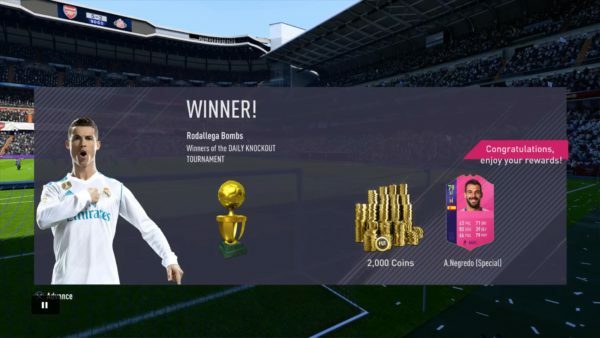 Between now and April 27, you will be able to earn items and trade them in for player items via Squad Building Challenges (SBCs). Special versions of players (at their base card rating) will be available at various points over the next few weeks through Daily/Weekly Objectives, the Daily Knockout Tournament (DKT), and other modes. There’s twelve to earn in total and they can be spent on Swap Deals players of varying quality and price. For example, the first item that can be earned is Alvaro Negredo, and you can get him by winning the DKT sometime between now (April 4) and 2 am ET on Friday morning (April 6), when the Weekend League begins. That’s the only way to get the card and he is one of the 12 Swap Deals that will be on offer over the next few weeks. You can either save up the items you earn by playing the game, such as the Negredo card, for the more expensive players, or trade in early for the cheaper ones. Since there’s only 12 to earn, you’re limited on what you can unlock. For more on FIFA 18 Ultimate Team, check out our extensive wiki guide.